So begins Jules David Prown’s ‘Mind in Matter: An Introduction to Material Culture and Method’. Essays such as this and E.McClung Fleming’s ‘Artifact study: a proposed model’ from the Winterthur Portfolio, sparked renewed interest in developing new methodologies for analysing artefacts. One such attempt is documented in ‘Towards a material history methodology’ by R.Elliot et al., which followed the attempts of a graduate history seminar at the University of New Brunswick in Fredericton to devise a new research model by adapting information from Fleming’s ‘Artifact Study’. In developing my understanding of collections studies and the ways in which it might contribute towards my research, I decided to focus on the work of Susan M Pearce, Professor Emeritus of Museum Studies at the University of Leicester, and her anthology, Interpreting Objects and Collections. Separated into two sections of essays, the first section focuses on the ways in which objects are interpreted within museum collections, while the second considers the collection as a whole. For the purposes of continuity, I will first summarise the latter section in order to continue the discussion about the nature of collecting. The first section, relating more to the methodology of material culture and anthropology will be summarised in the following post. Pearce further attempts to quantify these definitions by attributing each act to one of three modes of collecting: souvenir, fetish or systematic, in her essay ‘Collecting reconsidered’. The first of these, the souvenir, is associated with a person or their life history, and may also be categorised as ‘memorabilia’ or ‘personalia’. These objects, despite depicting the intimate details of a person’s experiences, are largely of little interest to the general public, unless the personality behind the collection is of particular note. (Pearce, 1994, p.195) Such a description may be applied in part to the Freud’s Sculpture exhibition at the Henry Moore Institute in 2006, but this was as much in how the work was framed as any inherent sentiment on the part of Freud himself. When discussing my artist book practice, I’ve been asked to consider why I prefer the context of a museum to display my work, rather than a library. Apart from thinking about the book as an object, I realised that the distinction, for me, was not so clear cut, and I needed to think more about the connections between libraries, museums and galleries. The similarities between these institutions are fundamentally related to to the nature of collecting and collections. The ways in which each fulfils drives to categorise, assimilate and organise the world, is how I understand my own practice, so I decided to read more about the psychology of collecting. Although Pearce herself separates collecting into three categories: systematics, fetishism and souvenir collecting (Windsor, 1994, p50), Bal suggests that all her listed motivations can be subsumed under the narrative of fetishism, through cutting the object off from its original context in order to reconstitute its meaning with the use of three common tropes: “synecdoche, the figure where a part comes to stand for the whole from which it was taken; metonymy, where one thing stands for another adjacent to it in place, time or logic; and metaphor, where one thing stands for another on the basis of similarity…” (Bal, 1994, p106). These examples focus particularly on the strong psychological reasons for the creation of collections, however, the historical nature of collecting always seems to point towards a need to possess and remove objects from the world. Therefore, has a new digital context introduced a more social element of sharing where image-objects proliferate? In thinking about the nature of museums, I have focused on the ways in which artists have critiqued the (art) museum format. However, as my initial project focused on anthropological concerns, I felt it necessary to re-examine the relationship of the museum to other cultural objects. The Pitt Rivers Museum (mentioned in week 62) is of particular interest due to its historicised nature, that is, in the way that it is presented as a 19th Century ethnographic collection, rather than according to a contemporary schema of museum curation. As it also hosts a programme for inviting and commissioning artists, the museum presents a useful case study in how contemporary artists respond to museum collections, as well as the history of anthropology. Previously, the museum has also worked with the University of Kent to provide a website of interpretive and contextual information about the museum’s collection of shields from Australia, Africa and Asia. In addition, the site also contains extensive bibliographies and essays about the history of anthropology, as detailed below. The museum as a didactic format for the study of natural and man-made objects has long been established. However, in the second half of the twentieth century, changes in museum policy and ethics created different ways of thinking about the museum format, particularly around collecting and displaying objects from field studies, as evidenced in the extract provided from Stocking’s ‘Objects and Others: Essays on Museums and Material Culture’. The challenges of displaying ethnographic objects in a museum environment are also discussed in the essays ‘Behind the Scenes: Museums and Selective Criticism’ by Brian Durrans, Oral Tradition and Material Culture: Multiplying Meaning of ‘Words’ and ‘Things’ by Julie Cruikshank, and Museums, Tourism and the Devil at Burlington Gardens by Tristan Platt. Durrans discusses the politics of representation and how museums can be seen as complicit in the oppression of the cultures that they aim to represent. His essay is centred around questions raised in the book ‘Exhibiting Cultures’, (eds. Karp and Lavine, 1991), which was based on a conference of the same name. These questions include the role that the author’s subjectivity plays in creating and disseminating anthropological knowledge and the ways in which museums and curators have tried to engage audiences within these processes, specifically in the privileging of exhibitions over the other work of the museum, such as research, documenting, collecting, and publishing. Cruikshank also discusses the difficulties of using objects to describe culture, particularly in the case of collecting oral traditions as artefacts, in the form of documents, tapes and video. This also intersects with new ways of thinking about ethnographic writing. She explains: “Native oral traditions have roots in procedure and methods different from written literary texts. Increasingly, indigenous writers are experimenting with literary forms, redefining ethnographic authority on their own terms and challenging images of their cultures presented by non-Western writers, film-makers and anthropologists”. Finally, Platt discusses the ‘Bolivian Worlds’ exhibition, and its glaring omissions in relation to the effects of Western market Capitalism on the region. He also suggests other potential interpretive strategies: “An exhibition plunged in near-darkness, carefully lit, and with adjoining ‘windows’ on specific topics… Visitors could even have been offered miners’ helmets and lamps on entry…”. This last observation in particular, resonates with the ways in which I have previously grouped objects in curatorial practice, which has made me consider whether I have been thinking of artwork as interpretation all along. My interest in the work of museums, and the ways in which contemporary art can interact with and signify museum practice, has led me to investigate the use of the vitrine as a mode of exhibiting artworks. The term vitrine refers to a glass case made for housing a collection of selected objects to create a visual display. Although I am primarily interested in the tactile and relational aspects of artworks, the exploration of the vitrine as a vehicle for the organisation of related objects is an area which I feel could intersect with my practice. He goes on to suggest four potential areas for consideration between sculpture and the vitrine, and the ways in which these instances have influenced art practice since the beginning of the twentieth century. 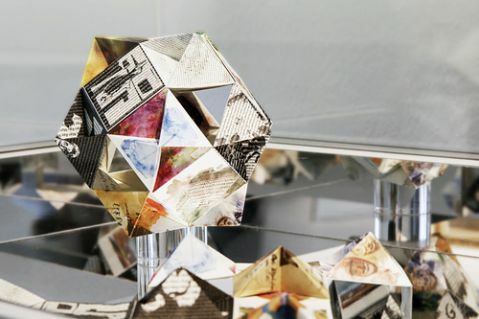 The four examples include the pre-modern reliquary, the Wunderkammer or Cabinet of Curiosity, the shop front or window display, and finally the fourth thematic area which is “marked by a loose genealogy of work that questions the very nature of the transparency, commodification, entrapment, and speciminization underwriting the viewing model of the vitrine” (Welchman, 2013, p.10). This array of historical practice relating to the use of the vitrine enables me to contextualise my work within a fine art tradition. However, this also creates further questions about how I might attempt to address these issues differently. Furthermore, the use of the vitrine, established as it is within an Enlightenment tradition of separating and recontextualising items according to museum classification schemas, also disrupts previous ideas of incorporating non-modern and networked ways of thinking into my project. Despite this, I feel that these questions can be addressed through a new investigation of the vitrine through integrating it into the the format of the work, as opposed to creating the work and its display case separately. This practice can also be equated with a ‘whole book philosophy’ in artists’ book practice, where the format and the content of the work are developed simultaneously, both complimenting and reinforcing the message of the work.